How Garden Shed Kits Can Help A Beginner Out Tremendously! 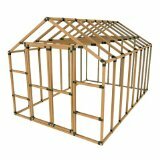 If you plan on building your own garden shed then you might want to consider looking at garden shed kits. To build a shed, you are required to have a few skills and a handful of tools. You may encounter some complicated angles when deciding to take on a project such as this. Garden shed kits will allow you to put together the outdoor shed and skipped most of the technical aspects in the process. There are two types of kits that you should be aware of. One kit is essentially a prefabricated shed that requires assembly on your part. The other type of shed kit will help you set up the framework of your shed and allow you to add your own customizable options such as siding roofing, etc. The shed kits that are essentially pre-made contain everything you need inside of the box. They could be made out of metal, wood or plastic. These usually entail several hours of your time and are moderately priced, if you shop around a little bit. These are great if you are a beginner and have little or no knowledge of building whatsoever. These do contain several hundred, or even thousands of pieces and staying organized is going to be key to your success. If you tools that will make the job faster would be a power drill or two and a couple of helpers. These are not required but will save you hours of assembly, not to mention some cursing. 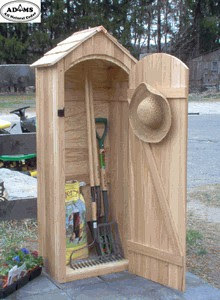 The other type of outdoor shed kit are more suited for somebody with a little more knowledge in the building department. They are kits that contain various fasteners that join together two or more pieces of lumber, alleviating any angle or miter cuts. All you have to do is cut the lumber using straight cuts, eliminating all of the time it would take to measure out and Mark the various angles. These kits are fairly cheap and will run you on average about $30-$50. You can join more than one together to make a larger shed if you would like and they even have optional kits for special features that you may want to include. As I mentioned before these sheds will require you to install the siding, roofing and finish material yourself. This is good because it allows you to have more control over the finished look of your shed. 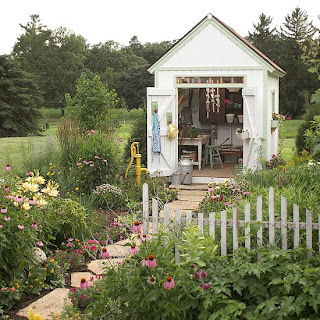 How To Maximize The Space Within A Small Garden Shed! 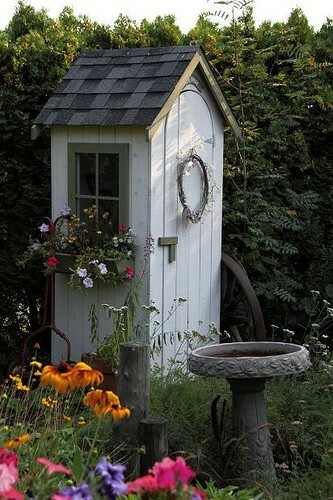 Many people think that they need a lot of space to accommodate a garden shed in their yard. This is not the truth, in fact there are several different small garden sheds that you could implement within your garden that could benefit you in a number of ways. Let's take a closer look at some of these small sheds and see what there is out there. The main purpose of a small garden shed is more than likely going to be for storage, unless you want to make it for a specific reason like maybe a potting shed. If you design a small garden shed the right way you will be able to get a lot more storage space than you might think you can. When building that plan on adding a few shelves around some of the walls to allow for additional storage that you would not have otherwise. Another great idea to maximize the area you have would be to add some type of additional shelving or maybe even some storage hooks to the ceiling to utilize that space as well. By doing this you will have more usable space available to you rather than the unusable space that would be there if you did not build shelves. The first thing to consider when building your small shed is of course going to be what size the shed should be. Take into consideration all of the different materials available to you including, metal, wood, vinyl and plastic. Each one of these materials as their advantages and disadvantages when it comes to the elements, so remember to do a little research before hand so you will be able to get a better idea of what type of material will work best. Take into account various factors such as insulation value, the area you happen to live and its climate, and other factors such as wind and rain. Some materials provide better protection against certain elements in will provide better protection depending on where you live. What many people don't realize is how much the design of the roof on a small garden shed can affect not only storage but the overall look and feel of your shed. If you build a shed that has a steeper pitch to it, it would allow you to build a space above the small garden shed that you could utilize for storage or anything else he could think of. The steeper the pitch of the roof, the more head room you will have to walk around. If you want just a small area for additional storage I would recommend building your roof at a 4 and 12 pitch, meaning for every 12 inches long, the roof rises 4 inches. If you want an area that you can comfortably walk around and then you should consider building your roof with a pitch somewhere around a 10 and 12 pitch. If you implement simple strategies such as the ones I listed above and you will be a lot maximize the amount of space within your small garden sheds. Just because the size of the shed is small, doesn't mean you can't add additional storage space. If you are creative and strategic you can get more space out of a small garden shed then you would with a larger shed. 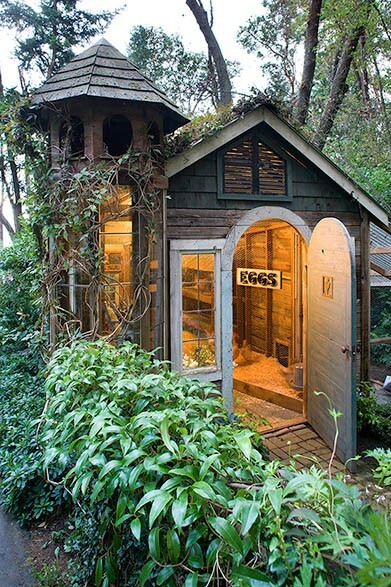 How About Your Garden Shed Design? 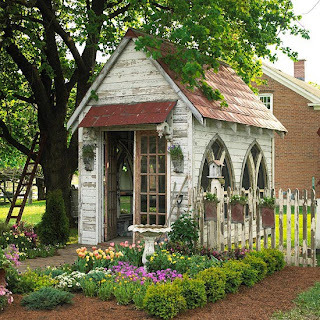 Choose A Garden Shed Design That Is Creative!! The idea of the garden shed has long since evolved past the point where it is just another bit of storage. Many people utilize their sheds in a plethora of ways, sure, storage still takes precedent but have you ever considered using your shed as your own private workspace? Or maybe you would find much more benefit in designing it to be a ‘get away’ from your home. Whatever your choice, you need to find garden shed designs to match. Let’s take a little look at what is on offer. When people start to look for a garden shed they no doubt toddle off to the local garden shop and purchase one of those wooden monstrosities. However, you want your garden to look as beautiful as possible right? Then why not consider some of these garden shed designs which don’t involve something bland sitting in the garden ruining the aesthetic appeal. What Is Your Garden Shed Going To Be Used For? When you are considering garden shed ideas you will want to consider what the purpose of the shed is going to be. If it is going to be a ‘get away’ then why not design the shed as a miniature form of your house? (or something completely different!). I have seen plenty of garden sheds which look like a small cottage which really do emphasize the getaway nature of what it is trying to achieve. If you have a potting shed then why not make it open plan so you can get access to what you need quickly and easily? Plenty of designs don’t have doors, this means that you can keep your tools dry whilst simply walking in and grabbing everything you need. You may even want to consider having a path run through the center. If you are looking to build a workshop then you have even more ideas to play with. In my opinion, when you are considering a garden shed design, you will want to bear in mind the surroundings it is going to be sitting in. You will want to make it blend in as much as possible, this includes paying attention not only to the materials that the shed is made out of, but also the angle of the roof. For example, if you have a birdhouse nearby that has a particular style of roof then why not try to match that on your garden shed? It will blend in much better causing your garden to look all that more beautiful. The best garden shed designs are ones that don’t look like sheds at all, they look like something brilliant and a place that you really want to be. Consider that when the time comes to build your shed. The only way that you are truly going to get what you want when it comes to garden shed designs is by building one yourself. Remember, there is a lot to consider with regards to a shed and that ‘traditional’ wooden object isn’t going to quite cut it anymore. So in summary you are going to need to consider what your garden looks like and the functions of the shed then build up from that. 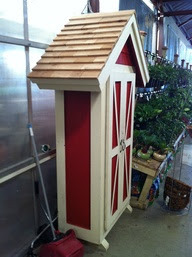 How About a Cheap Garden Shed? 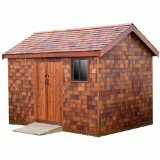 Cheap garden sheds are a great addition to any backyard and can provide you with the means of organization and functionality. When you're looking to either build your own backyard shed or maybe interested in buying one, then there are a few things you should take into consideration before you make your final decision. 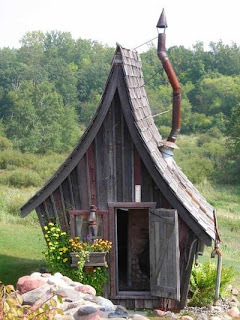 I'll start off by talking about a couple of different garden shed designs. The next thing you should consider is what you want your shed to be made out of. Wood, metal and plastic are three common and popular elements that make up today's modern sheds. Knowing a little bit about the advantages and disadvantages that come with each type of material allows you to make a much better decision. 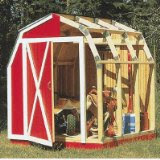 The cheapest and best way, in my opinion, would be to build your own backyard shed. When you build your own shed you have so much more control over the different elements that make up the project. You are able to customize any feature, anyway you would like just about any time throughout the whole building project. If you simply bought a shed your choices would be very limited and it wouldn't be guaranteed that you would even find one that you would like. If you do plan on building your own shed I would recommend starting out building a small garden shed rather than a larger one. With a smaller shed your able to get a feel for how the building process will be and a little practice before making mistakes on a larger more expensive shed. Naturally a smaller shed is going to be a lot cheaper to build than a larger one, so you will save money by starting off building one of these first. Large garden sheds can be a lot more complex and will take a lot more time for you to build. You can save yourself some time and frustration by having a set of shed plans by her side to help you out throughout the project. They provide you with a visual drawing, so you can actually get an idea of what it is you're going to be building exactly. They also have specific instructions including measurements and exploded views of the harder parts of the building process like the roof. This will greatly reduce the chances of you making a mistake compared to if you were building off of an idea you had in your head. A lot of them come with a materialist that provides you with a complete breakdown of all the materials that are required for the project before hand. 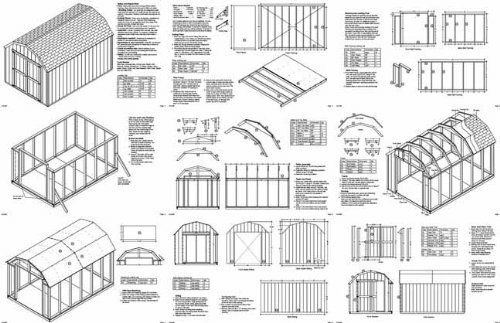 If you plan on building your own garden shed using a set of plans, then I hope these tips have helped you out and give you a little more insight on what to expect before you start.